Locating the presence of all the geological elements required for a commercial accumulation of oil and gas requires a careful blend of science and skill. To discover the shape and composition of rock deep underground, our geologists first examine and study rock formations exposed above ground in surface outcrops. They also examine aerial photographs and satellite images. 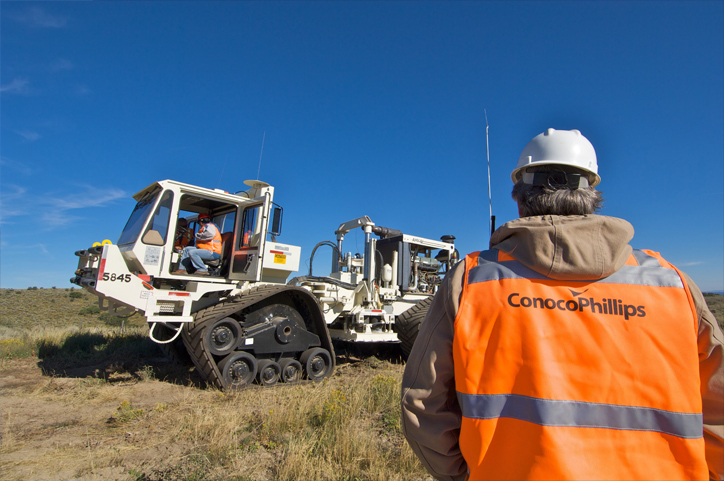 By studying the above ground formations, our geologists try to determine the direction and depth they continue to go underground to predict the likelihood of a geological structure that might contain hydrocarbons. Once our geologists locate an area that looks promising, they work with our geophysicists to acquire seismic data that provides an image of the subsurface that allows the geology to be mapped in greater detail. When a geological feature that has a high chance of containing hydrocarbons is identified, a well is drilled into that structure. Once a well is drilled to the depth at which the hydrocarbons are expected, a well log is created. A well log provides electronic data about the types of rock present in the well and what, if any, fluids (oil, gas, water) these rocks contain. Well logs are usually made by lowering a measuring device, called a logging tool, to the bottom of the hole and then measuring the reservoir properties as the device is raised to the surface. In addition to a well log, a core sample is taken from the well. The core sample provides a piece of the reservoir rock that can be analyzed to describe the characteristics of the rock in the well. The information gained from the well log and core sample helps determine whether a well should be completed to produce oil and gas or if it should be filled with cement and abandoned as a dry hole.